I may be biased, having spent the better part of a decade living in New England, but nothing quite marks the beginning of summer like a blueberry pie. The feeling of that first bite of pie is almost as good as the warmth and perceived freedom that summer brings. Its sweetness suggests the beginning of something great and its tang reminds you not to take its fleeting ways for granted. With it's buttery crust and brilliant sapphire hue, I can think of no better partner to a sunset, a stolen kiss and a glass of Diamond Collection Chardonnay. This pairs extremely well with one of my favorite albums to welcome summer, “Vertigo” by Groove Armada. Prepare the blueberries. Mix all dry ingredients, lemon zest and vanilla in a large mixing bowl. Add blueberries and toss until all coated. Lay flat both pie crusts and using a cookie cutter or drinking glass, cut them into 24 2 inch circles. Line a muffin tray with 12 of the crust circles, bringing the sides up to the top of the muffin tin cups. 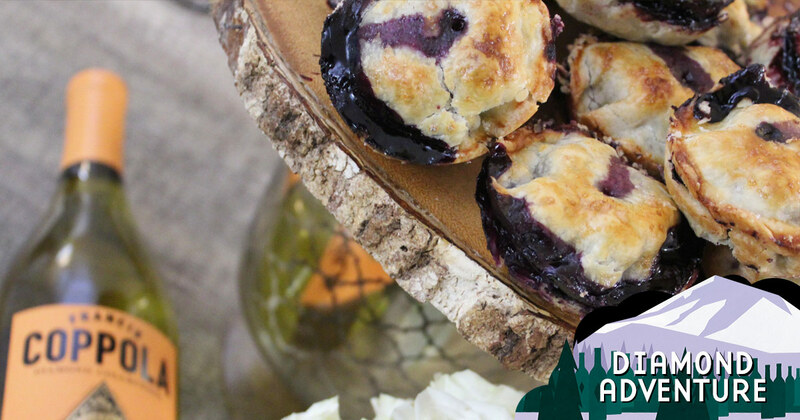 Fill each crust lined cup with blueberries. Top each bottom crust with a top crust – connecting them by the sides. Brush each pie with beaten egg, dust a bit of sugar over each and using a skewer, drill a little hole in the top of each.